Rae Mahaffey explores color, pattern and perspective to describe elements in the world around us. She paints abstractly, expressing visual experiences and the subconscious through formal artistic means. 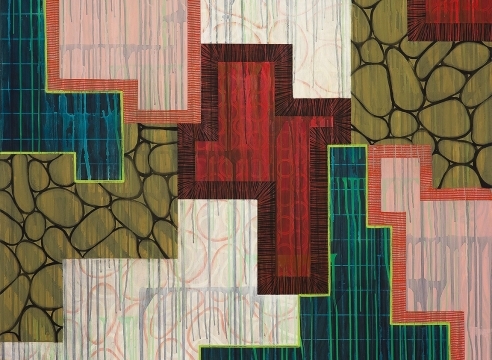 By contrasting geometric and 3-dimensional forms with organic patterns and color, Mahaffey begins to question traditional perceptions. Juxtaposing forms in unexpected ways, her spatial compositions are playful and modern. In this exhibition, Engineering, the work is influenced by both the old and the new. An engineering book from the 1930s inspires some of her spatial forms, defining space and geometric structures. The illusory space is built up from opaque and transparent paint using synthetic and organic pigments. Some trompe l’oeil of the wood surface enhances this illusory quality. Mahaffey’s fresh, direct approach, whether in paint, prints or glass, is thought provoking, visceral and contemporary. Rae Mahaffey studied at the University of Copenhagen, Denmark and the University of Washington. She moved from Seattle to Los Angeles in l988 where she worked as a curator for Gemini G.E.L. and as a consultant for David Hockney's studio. She moved to Portland in 1992 to start Mahaffey Fine Art print studio with her husband Mark. Exhibitions include the Portland Art Museum, OR, Marylhurst Art Gym, OR, Maryhill Museum, WA, and the Schomburg Gallery in Santa Monica. Her 2008 commissions include a Washington State Arts Commission for Gray Middle School, in Tacoma and the Pacific First Center, Harsch Investment Properties, in Portland.